Patrick Kengi Takahashi, Ph.D., is the Director Emeritus of the University of Hawaii Natural Energy Institute, and co-founder of the Pacific International Center for High Technology Research (PICHTER). In 1979, Dr. Takahashi led a comprehensive study on energy self-sufficiency and published a book, Solar and Wind Handbook for Hawaii. He concluded that Hawaii needed to help find a replacement for jet fuel because of the state economy’s dependence on tourism. He decided that a hydrogen-fueled aircraft was the future of air transportation for both tourists and air cargo. During the second energy crisis of 1979, Dr. Takahashi joined U.S. Senator Spark Matsunga’s office. There he drafted the hydrogen bill that became known as the Matsunaga Hydrogen Act, which established the national hydrogen program. 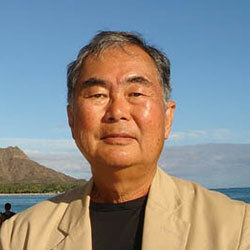 He returned to Hawaii in 1982 to co-found PICHTR to take university research in sustainable resources to the marketplace. In 1983, Dr. Takahashi became the Director of the Hawaii Natural Energy Institute. During his 15 years of leadership, he was the principal investigator for more than $25 million of projects from the National Science Foundation, National Aeronautics and Space Administration, and the Departments of Energy, Defense, Interior, and Commerce. He also has served as the Secretary of the Board of Directors of the Natural Energy Laboratory of Hawaii, and chair of the U.S. Secretary of Energy’s Hydrogen Technical Advisory Panel. Dr. Takahashi helped form the teams that became the U.S. Department of Energy’s National Hydrogen Center, the National Science Foundation’s National Marine Bioproducts Engineering Center, and the Department of Interior’s National Center for Marine Resources and Environmental Technology at the University of Hawaii. He also worked at the Lawrence Livermore National Laboratory on laser fusion and with the NASA Ames Research Center on the Search for Extraterrestrial Intelligence. Dr. Takahashi was awarded the Bechtel Energy Award from the American Society of Civil Engineers in 1999, the Spark Matsunaga Memorial Award from the National Hydrogen Association in 2006, and the Ocean Pioneer Award from the Ocean Energy Council in 2007. He presented the 2003 Anton Brunn Memorial Lecture to the Intergovernmental Oceanographic Commission in Paris on “Energy from the Sea,” and chaired the 2004 Next Generation Fisheries Summits held in Tokyo. Dr. Takahashi was born and raised in Hawaii. He has a B.S. in chemical engineering from Stanford University and a Ph.D. in Biochemical Engineering from Louisiana State University. He worked in biomass engineering and computer applications for industry, and in 1971 joined the University of Hawaii College of Engineering, teaching courses in renewable energy, computer programming, environmental engineering, and technology and society. He also served as associate dean of engineering and in the chancellor’s office. In the 1970’s, Dr. Takahashi served as the reservoir engineer for the successful Hawaii Geothermal Project, and developed the Puna Research Center to utilize the geothermal effluents for new industries. He also directed the wind power applications program for Hawaii and served as chairman of the Wind Energy Division of the American Solar Energy Society. Dr. Takahashi has published more than 100 papers on various aspects of ocean resources and renewable energy. He is also the author of two books, Simple Solutions for Planet Earth (2007) andSimple Solutions for Humanity (2008). To read more about Dr. Takahashi , visit his personal site.